Do you like long songs with an epic feel, similar to bands like Buried Inside and Titan? Then you'll like Locktender. These 3 tracks clock in at just about 25 minutes and take you on a quite a journey of dynamics. The recording quality is a little gritty, but it works well here and the band's huge sound seems to be translated perfectly. High gain guitars, sledgy bass and powerful drums blend well just below some dual vocal screams. Songs like "Visions of the Daughters of Albion" is a good example of what field this band likes to play in. There's some very quiet single guitar parts featuring introspective chords and picking, usually juxtaposed with a huge crashing wall of doom. They seem to have their sound down pretty well. 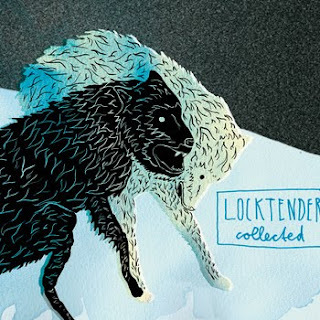 Locktender deviates a little from the doom ridden sound every now and then and dips their feet into more of the melodic, or dare I say "screamo" genre, at moments. This is most apparent in some of the clean guitar interludes that I mentioned before and some of the more melodic chaos that they tend to insert between the crushing doom sounds. Check out the second track, "The Strangest Secret" for an example of this. "The White Dam" is another 10 minute track that concludes this release. I wasn't especially happy with the growling vocals over the clean intro. It works better over the crushing sound better, but sort of exposes some weakness during cleaner parts. There's an awkward transition to some faster paced parts here and it seems like it takes the band a second to catch up. They make a strong comeback though and the release concludes abruptly with some powerful, frantic soundscapes. All in all, this is long ride, so if you're up for it, buckle up. You'll probably thank yourself.